Somewhere between ToDo lists and calendar appointments lies TimeSpan. You can think of it as a way to keep track of important periods of time, reminders with a tail, whatever, but basically the app allows you to mark off segments of time when the beginning and end are important. A common use for this might be to mark off a working period, or a break period. If you’re a freelancer that needs to be reminded when you’ve worked a certain number of hours, for instance, you can do that with TimeSpan. 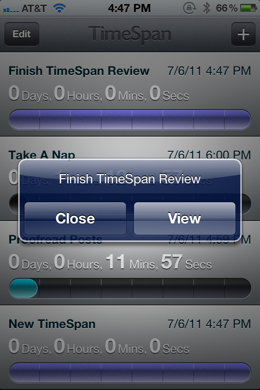 At its core, TimeSpan [App Store, $0.99] is a beautifully designed app for iPhone that allows you to set a start date and an end date to create a ‘span’, or period of time. The uses for it are widely varied, cooking, napping or many other activities can be measured well this way. Alternatively, you can use TimeSpan as a countdown timer. Just mark the date of an anniversary or birthday and leave today’s date alone and you’ll get a gorgeous, color-shifting countdown timer to your special day. For events like anniversaries or family trips that happen every year, you can set up recurring TimeSpans that will persist and continue to alert you of those important events. 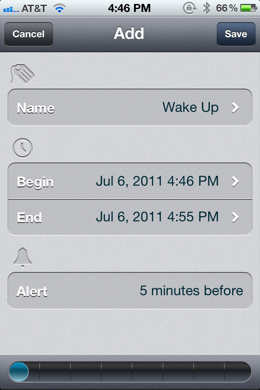 If, like me, you need a couple of warnings to wake up from a nap, you can also set up to two reminders per TimeSpan. 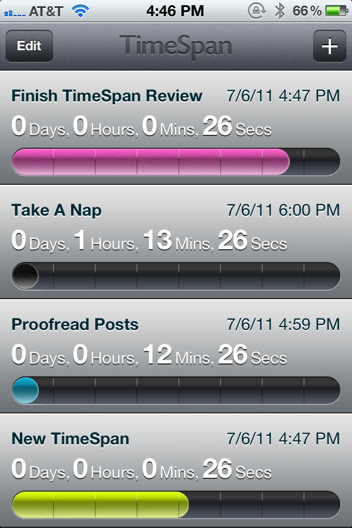 TimeSpan is a singularly focused app that does very little outside of keeping track of these spans of time. But it does it incredibly well, with a cleverly designed interface and a super quick workflow. You should be able to set up a new span in just a couple of seconds. To start a new span, you just tap the plus button in the corner. Then you can name the TimeSpan, give it a beginning and end date (and time) and choose an alert. The alert scale follows the basic format of the standard alarm clock alerts in the iPhone’s Clock.app. If you’re looking for an app that’s capable of building complex project reminders then don’t look to TimeSpan to fit that bill. It is by nature a lean and mean timer app that focuses on speed and beauty instead of a massive feature set. If you’re willing to work within the very narrow boundaries of its capabilities however, you’re going to love how gorgeous and effortless TimeSpan is.